Having survived multi-backed planetary beasts and buttock-facilitated time travel, the Futurama gang is back for its third round of feature-length fun. In Bender's Game, Earth's gas prices are out of this world, which means Fry, Leela, and the rest of the crew of the Planet Express delivery company are, too ... when they embark on a mission to harvest resources from the world's only dark-matter mine, that is. What they find in their subterranean safari, though, is a world that's less flying cars and robot-human unity and more dungeons and dragons. But why do all the drunken knights who populate this majestic land look so much like Bender? Bender's Game once again captures the blend of whip-smart satire, low-brow humor, and unbounded imagination that's been a hallmark of Futurama since creator Matt Groening's original series first hit the air. 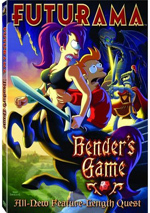 For the third of the Futurama direct-to-DVD films, we head to 2008’s Bender’s Game. For this adventure, Planet Express encounters a shortage of dark matter, the fuel needed to run the ship. This eventually sends the crew to the dark matter mine operated by “Mombil”, the corporation controlled by evil entrepreneur Mom (voiced by Tress MacNeille). In the meantime, Bender (John DiMaggio) deals with a separate issue. Early in the film, he tries to play Dungeons and Dragons but fails due to his absence of imagination. Eventually Bender manages to develop an imagination – too much of one, we discover, as he becomes completely wrapped up in the fantasy world. Because of this, the crew places him in a mental institution. Eventually the two threads come together as Bender and the others get involved in a wild adventure with nods to D&D, The Lord of the Rings and other fantasy pieces. Both of the prior Futurama direct-to-DVD films entertained me in a moderate way but they failed to become anything special. Unfortunately, that trend continued with Game. The movie had its moments but failed to coalesce into something memorable. As usual, the parts segments revolved around the robots. Bender remains my favorite character, and the flick’s other mechanoids also provide great amusement. When we see Bender in the looney bin, the flick works much better and becomes quite inventive. The other robots are entertaining and give the movie the kick it needs. Otherwise, there’s not a lot here to stand out as all that impressive. The story’s attempts to connect with modern ecological matters makes it seem oddly dated, particularly because of the recent decline in gas prices. Granted, I’m sure that situation will change, and it’s not like oil corporations suddenly seem less greedy, so “Mombil” remains a reasonably pointed satire. Nonetheless, the whole story feels forced to me. Those behind it try so hard to provide ecological and political messages that the result suffers. No, I won’t argue that series like Futurama shouldn’t attempt this sort of satire, but the result here just doesn’t ignite. The film makes its points so obvious that it leaves me cold. Like the two earlier Futurama films, Bender’s Game manages to entertain. It just never turns into anything particularly dynamic and memorable. Average Futurama is still reasonably amusing, but Game doesn’t compare to the best of the TV series. 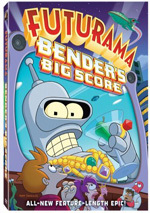 Futurama: Bender’s Game appears in an aspect ratio of approximately 1.78:1 on this single-sided, double-layered DVD; the image has been enhanced for 16X9 televisions. Both of the other Futurama flicks looked great, and that trend continued with Game. At all times, the movie boasted excellent delineation. It seemed crisp and detailed, without any noticeable hints of softness. I recognized no signs of shimmering or jagged edges, and edge enhancement also failed to materialize. In addition, I found no source flaws, as the flick looked clean and fresh. Like its predecessors, Game delivered a dynamic palette. The colors always came across as bright and full. Blacks seemed deep and firm, while shadows showed nice clarity and smoothness. All in all, this was a terrific visual presentation. I thought the Dolby Digital 5.1 soundtrack of Bender’s Game worked reasonably well. For the most part, the audio concentrated on general atmosphere. Some action sequences added pizzazz to the piece, and the Planet Express ship zoomed around the room in a satisfying way. We also got nice stereo imaging for the score. Otherwise, the track gave us a good feel for the environment but not much that impressed. Throughout the film, audio quality satisfied. Music was full and rich, as the score seemed well-recorded and dynamic. Effects also showed good range and delineation, and they boasted strong low-end response when necessary. Speech appeared concise and natural; no edginess or other issues interfered. This was all good enough for a “B”. When we head to the set’s extras, we open with an audio commentary from creator Matt Groening, director Dwayne Carey-Hill, producer Claudia Katz, co-executive producers David X. Cohen and Michael Rowe, and actors Billy West, John DiMaggio, and Tress MacNeille. All of them sit together for this running, screen-specific chat. They discuss various story and character issues, animation specifics, references, and some acting choices. I’ve listened to a lot of Futurama commentary, and this one follows the usual trend. Cohen leads the charge with allusions to nerdy references and some movie-related specifics. The other filmmakers chime in with occasional notes, while the actors perform funny voices and goof around a lot. This makes the commentary entertaining – if occasionally chaotic – but not terribly informative. Actually, you’ll learn a decent amount of info about the flick, but details take a backseat to silliness most of the time. Go into it with that understanding and you’ll enjoy it, though I’m disappointed West does none of his terrific Nixon impersonation. For something unusual, we go to the Futurama Genetics Lab. This offers a selection of seven characters from which to choose: Fry, Leela, Bender, Professor Farnsworth, Dr. Zoidberg, Morbo and the Hypnotoad. Pick two to “combine their DNA” and you’ll see a drawing of the result. It sounds dopey but it’s lots of fun, and the sheer number of possible combinations means you’ll get to spend quite some time with it. Next comes a featurette entitled Dungeons and Dragons and Futurama. In this seven-minute and three-second piece, we hear from Cohen, Rowe, and writer Eric Kaplan. They discuss their experiences with D&D and let us see some Futurama sequences influenced by the game. Cohen continues to be the nerdiest man on the planet, with Rowe close on his heels. The baseball bat-wielding Kaplan – a beefy dude who apparently never played D&D – balances out that side of things, however. I like this glimpse of the series’ references to D&D. Another featurette arrives with How to Draw Futurama in 83 Easy Steps. Via this seven-minute and 52-second program, we find out how to sketch Zoidberg, Leela, and Bender. The artists give us some nice thoughts about their work along with a bit of comedy in this fun piece. Next we find a 21-minute and 47-second Storyboard Animatic. This takes us through the first act of Game and lets us see the storyboards accompanied by dialogue and some music. It’s a fun way to see the early stages of the film. After this comes a five-minute and three-second segment called 3D Models with Animator Discussion. The piece doesn’t identify the commentators, unfortunately. They look at the “Smash Up Derby” ships and detail the work behind. The info tends to be a bit dry, but some interesting notes emerge. Only one Deleted Scene appears. “Cup or Nozzle?” runs one minute, three seconds as it shows the D&D-playing kids as they get beverages – with the sought-after crystal in tow. It’s a minor addition at best, so it doesn’t go missed from the final film. Blooperama 2 runs one minute, 50 seconds. It shows the actors in the studio as they perform the lines, goof up, and joke. I’m not wild about bloopers, but this reel offers some fun glimpses of the recording process, so it’s worth a look. During the one-minute and 12-second Bender’s Anti-Piracy Warning, we get a funny spoof of the usual DVD warnings. It parodies the “you wouldn’t steal a…” format, except Bender will steal pretty much everything. Does this mean the clip actually encourages piracy? Finally, we find Into the Wild Green Yonder: A Sneak Peek at the Next Futurama Epic. A preview of the fourth Futurama direct-to-DVD flick, it lasts one minute, 13 seconds and gives us a trailer for the upcoming effort. For some non-disc-based material, the set includes four postcards. These provide some nice Futurama art and finish the package in a positive way. Does the third feature-length Futurama flick outdo its two mediocre predecessors? Unfortunately, it doesn’t. Like the two earlier efforts, it offers moderate entertainment, but it never becomes particularly memorable. The DVD comes with excellent visuals, very good audio, and a smattering of decent extras. As with the two other DVDs, Futurama fans will want to check out Bender’s Game, but they shouldn’t expect greatness from it.